This Advanced Course of 3 DVDs shows 10 hours of presentations covering algebra, trigonometry, calculus, coordinate geometry, Simple Harmonic Motion, projectile motion, recurring decimals, solution of polynomial and transcendental equations etc, It is suitable for anyone having a basic knowledge of the Vedic system and wanting to learn more, especially students, teachers and researchers. 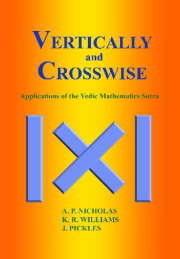 There is an introduction including background, history, structure and features of Vedic Maths. Proofs and explanations are given and the coherence of the system is displayed. 5 – Calculus Methods – quadratic equations, partial fractions, derivatives of products and quotients and trig functions, series expansions, integration by ‘parts’ etc. Just finishing your Advanced DVD course on Vedic Math -- such a joy.